One of the things Open Square is known for, what sets us a little bit apart from other mills, is the elegant design you’ll find on site and inside the building. Give John Aubin (Open Square’s Owner and Architect) an opportunity to custom design something around here and (if he has the time) he’ll take it. 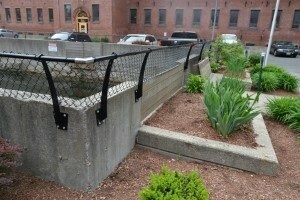 The fencing in our Mill 4 and Mill 1 main parking area was a relatively small project John worked on with his steel fabricator (Steelhead Studios, just across Dwight Street from us in the Wauregan Building). Open Square added the fence for another level of safety to the canal that feeds our D Wheel hydro electric turbine without obstructing the view. 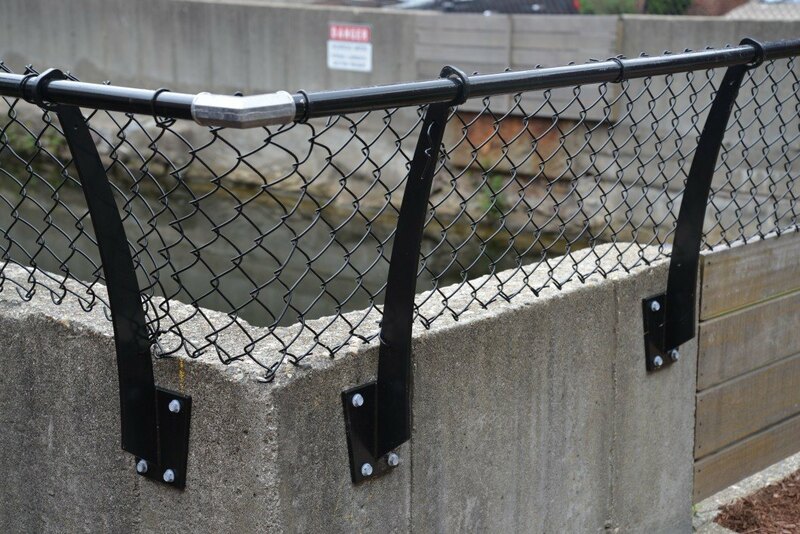 The curved brackets are designed to hold the chain link fencing and rail away from the canal. It is friendlier than a vertical fence, also quite a bit harder for little climbers to scale. The curve doubles as a cost saving fabrication technique. Laser cutting steel was the only practical way to make these brackets (ie a good excuse to use this very neat tool), but can be rather expensive. 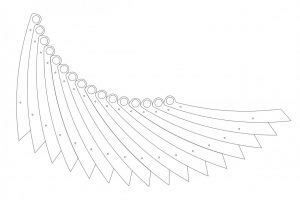 John designed the brackets using the same radius curve on both sides for “nesting” the curved pieces on a 3/8″ sheet of steel for fabrication… one cut takes care of the front of one and the back of the next one. The result was less waste and about 40% less cutting.